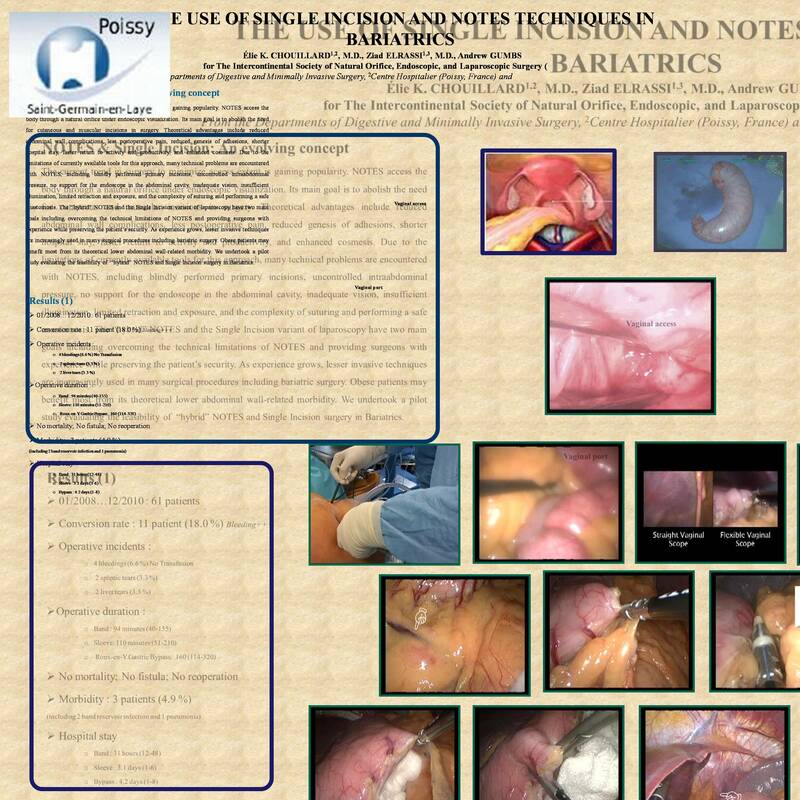 Aim: Natural Orifice Translumenal Endoscopic Surgery (NOTES) is an emerging concept in surgical ideology. Many variants have been described including « pure » NOTES, « Hybrid » NOTES, or even endoscopic surgery. Single Incision Laparoscopic Surgery (SILS) has been inspired by the potential advantages of NOTES including less abdominal wall complications, less postoperative pain, faster return to activity, and better cosmesis. This study analyzed the results of our preliminary experience with these new techniques in Bariatric surgery. Methods: All patients were prospectively included after a written informed consent. The Ethical Board of the Hospital approved the study. All types of bariatric procedures could be theoretically included. Patients: From April 2008 to September 2010, SILS or NOTES (either hybrid or pure) was attempted in 87 selected bariatric patients. Exclusion criteria comprised mainly prior open abdominal surgery, more than 50 Kg/m² BMI, ASA III status, organ insufficiency, and hemostasis disorders. Results: The success rate without conversion to laparotomy or additional port sites was 85.1 % (74 patients). Procedures included Sleeve gastrectomy (41), band insertion (16), StomaphyX endoplication (14), gastric bypass (12), band retrieval (1), , and miscellaneous (3). Mortality rate was nil. The overall morbidity rate (mainly minor complications) was 8.0 %. One patient was reoperated (1.1 %) for bleeding. Conclusions: SILS and NOTES procedures are safe and feasible in selected patients with morbid obesity. Advantages regarding postoperative pain and length of hospital stay could be demonstrated. However, larger scale, prospective, controlled, randomized studies are needed for further evidence-based analysis.